- God help us if the only place the citizens of our County can enjoy 'justice' is in works of fiction projected in the dark of a movie theater! Like the rest of you, I was thoroughly outraged by the Stalinesque raid on Roger Stone’s home by about two dozen armor-clad FBI agents. What a relief Trump fired Sessions and put Whitaker in charger so that Justice & the FBI could continue to adhere to the Stasi procedure manual for the arrest of non-violent political dissidents to wit: pre-dawn raid with assault rifles and the People’s News Network in tow! I had high hopes when I first laid eyes on Whittaker with his clenched teeth and steely eyed resolve. My revised working hypothesis for the lock jaw and the bulging eyes is because he’s sitting with his thumb up his a**. Here is a one minute clip, taken from my movie Alien Anthropologists in honor of the Gestapo like arrest of Stone on Friday. The hero of my movie, Jack Wilson, an Afghanistan war vet, newly elected to congress by unseating an establishment incumbent, has vowed to clean out the swamp. Good luck with that Jack! In the one minute clip, Jack’s home is raided in the dead of night by a team of MP-5 sub-machine gun tooting FIB Agents who have come to arrest Jack on a Deep State pretext. If I say so myself, I think the writer of my film is prescient. This scene was filmed almost two years ago. Alas, we had high hopes two years ago that there would in fact be some swamp cleaning and that our dear Country, that place that, not too many years ago, Reagan reminded us was “that shinning city upon a Hill” would be restored to a nation of laws and a place of freedom and justice for all regardless of race, creed, color or political affiliation. I shot a 25 minute Episode from my full length screenplay for Alien Anthropologists to promote interest in the feature length treatment of my story. Alien Anthropologists, a Romantic Comedy Political Farce, takes place in the not too distant future of an America further along the dystopian road to ruin. Alien visitors (not the not ones from Honduras – the ones from outer space!) have come to earth to observe the imminent self-destruction of humanity. Scientists from a distant would, they are here only to observe the fall of our Old Rome and have been assigned to the center of evil on the planet – Washington D.C.
My Episode from Alien Anthropologists has been on the film festival circuit for the past year and has won several top awards throughout Planet Earth. Recently I just got back from another film festival in Borrego Springs, California where we showed the Episode of Alien Anthropologists to an enthusiastic and highly appreciative audience of about 200 unwashed deplorables from the local community on Monday January 21, 2019. 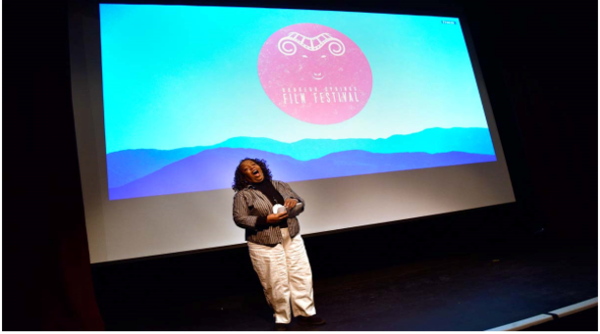 In the audience was the co-moderator of the festival, a black woman named Lonnie McCabe. In talking to Ms. McCabe after the screening of my film she shared with me the fact that she is on the left side of the political spectrum “though not the ‘radical’ left side.” Nevertheless she loved our film telling me in part “… if you are able to get this made people with love it! The timing is perfect!! … Yes, I see things differently than you but I believe in having a dialogue on the issues and a great way to do that is through humor.” If only a majority of those on the left felt the same way we would actually have a functional government! Lonnie McCabe belts out “Over the Rainbow” just before the screenings at the Borrego Springs Film Festival, January 21, 2019. View of the appreciative audience watching our movie on January 21, 2019. Lonnie in the foreground. Lonnie in the foreground. Another view of the Borrego Springs audience enjoying the screening of Alien Anthropologists – Episode III on January 21, 2019. One thing I much appreciated at this particular festival (unlike the others I have been to) was the involvement of the local community. Every screening, ours included, was packed. Our movie screened along with five others on Monday morning, the last day of the five day festival. 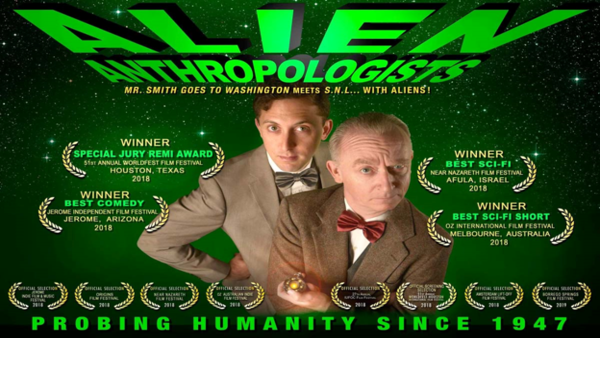 The audience response to Alien Anthropologists was indeed heartening as the audience laughed and clapped in all the right places. Though we have won several top awards throughout our beleaguered planet, we did not win an award at this festival. We were in competition with 36 other short films for one “Best Short Film” Award. If there was one criticism of this festival, it is that they did not break the short films into categories i.e., Dramatic; Comedy; Sci-Fi, etc. When I saw that the three judge panel for the “short film category” – “Donna”, “Hillary” and “Janice” were three women with left leanings, I have to admit I wasn’t too optimistic that our little right wing hate filled misogynistic screed would get the top award. In fact, the film they voted as “Best” was an emotionally intense psychological drama with English sub-titles entitled “Traces” by a French film maker who was not present for the festival. The program summary of this intense emotional film: “When her mother dies, Julie discovers that her father is not her real father. Her family references are shaken. Can she still consider the person she thought was her father as such?” This politically correct film featured the heroin retching into a sink at work and in another scene sobbing uncontrollably as she attempts to scrub clean her mother’s gravestone while in a psychotic state as she deals with the intense realization that the person she thought was her father was not her real father. Both co-producer Chris and I were observing audience reactions during the mornings screening session which included both our film and the cinematic masterpiece that won the top award - “Traces.” From what I observed there was only one film (not the “top” award winner) shown that morning where the audience was boisterously laughing and thoroughly enjoying themselves – Alien Anthropologists. No, they weren’t laughing when Jack got arrested. However, Alien Anthropologists is a comedy. Everyone (with a little help from Zeno) ends up living happily ever after. While most of the other films were being shown, the audience appeared to be in pain. Constantly checking their watches, they appeared to be wondering when the ordeal would end. During the screening of our film, they lost themselves. Forgetting that they were watching “high art” the audience leaned forward in their seats and thoroughly enjoyed the flight into the fantasy world where “justice” and the “American way” prevailed. Afterwards, both at the screening and later that afternoon at the awards ceremony I was approached by many, many audience members who went out of their way to come up to me personally and express how much they enjoyed (and laughed at) Alien Anthropologists. Each day of the five day festival the festival handed out paper ballots where those watching the films could nominate their “favorite” for the “People’s Choice Awards” in each of the five main categories (Animation; Latino Film; Documentary; Short Film & Feature). No – comedy (especially the right wing politically incorrect deplorable fool variety) is neither deep, profound nor high art! That many of the organizers and judges of the event are on the left side of the political divide, how did our little politically incorrect low-brow gem even get selected for screening at the Borrego Springs Film Festival? I believe that had to do with the community involvement at this event. This event had a fifteen member selection committee which made the initial choice out of the many entries as to which 70 films (ours one of them) would be shown at the five day festival to the local community. A majority of those on the selection committee are comprised of citizens (not justice warrior film makers) of the local community. I attended the opening party on the first (Thursday) night of the festival, went home for three days to take care of things on the home front, and then returned the night before (Sunday) the screening of my film on Monday January 21st. 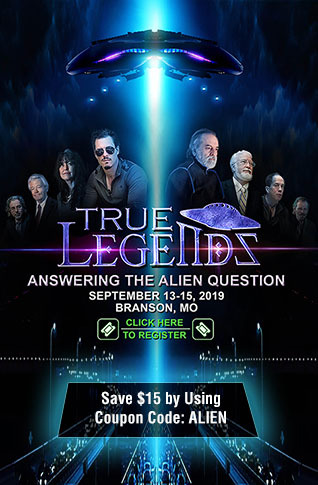 Though most of the people in the local community who attended the screening are of my generation (to wit: old farts) I was also very gratified that two young people came forward to express their enthusiasm for Alien Anthropologists. These were two teenage girls (about age 15 or so) who are in a local film making program. One of them fancies herself a screen writer and both begged to be given some kind of job on the movie should we go forward with the full length production. I suspect that the Zeno character (a quirky little Alien in a good-looking humanoid male body) strikes a responsive chord with the typical female teenager. As I spoke to them they both squealed, “Zeno! He’s so cute! !” If this thing’s a go, trust me – we are going to sell allot of Zeno paraphernalia! As an added bonus, we are going to indoctrinate (is that the proper term when we are dealing in truth?) the younger generation with conservative values. Another view of the Borrego Springs unwashed enjoying the screening of Alien Anthropologists – Episode III on January 21, 2019. What can I say? Except for a small smattering of film makers whose films were being shown that morning, the 200 or so people in that audience on Monday who were eating up Alien Anthropologists with loud guffaws and enthusiastic applause weren’t a bunch of high-brow film critics. They were just a couple of hundred common citizens from the local community – the kind of people - low-brow unwashed deplorable fools - who will pay good money for the cathartic release that comes from suspending disbelief in a darkened movie theater if only for a brief time to enjoy a mythical world in a make believe Nation were truth and justice prevail through the actions of an quirky alien visitor named Zeno. I was indeed grateful for the honor of having my humble little political farce screened before the citizens in the little but very beautiful town of Borrego Springs! God help us if the only place the citizens of our County can enjoy justice is in works of fiction projected in the dark of a movie theater! Robert Kirk Robert Kirk, a retired prosecutor, suffers from a rare malady that afflicts only a tiny percentage of his fellow Californians: commonsense conservative thought. To contact or to follow his current politically incorrect project, go to www.alienanthro.com.